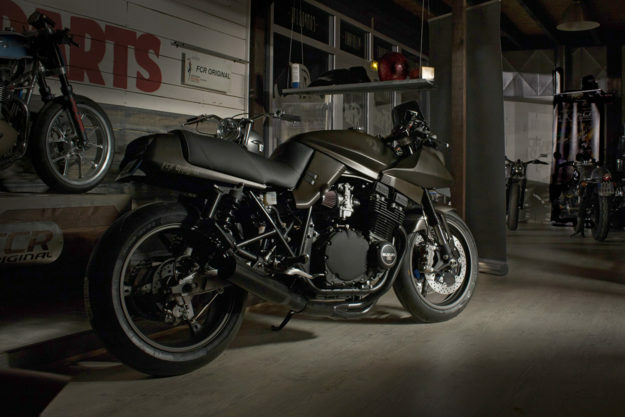 Like a good pair of leather boots or a fine Cabernet Sauvignon, the Suzuki Katana just seems to get better with age. The rapier-sharp design is 35 years old now, and no longer has the power to shock. Instead, it’s heading for icon status. 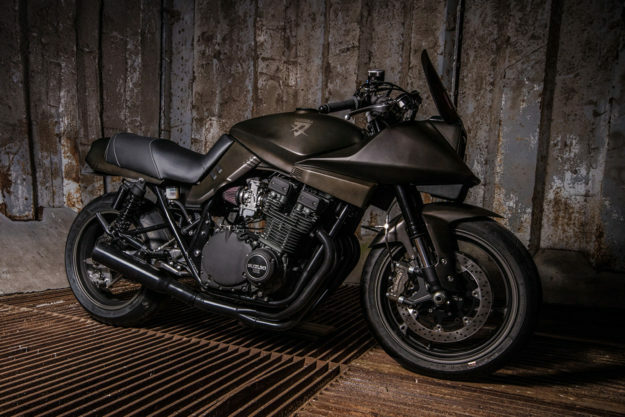 We’re now seeing Katanas rolling into custom shops, and it’s interesting to note the parallels between the Katana’s gestation and the inevitable cycles of the modern day custom scene. Just as we’re moving on from the ‘brat style’ and checkered-stripe café racers that dominated the past few years, Suzuki was observing a similar shift in the late 70s. 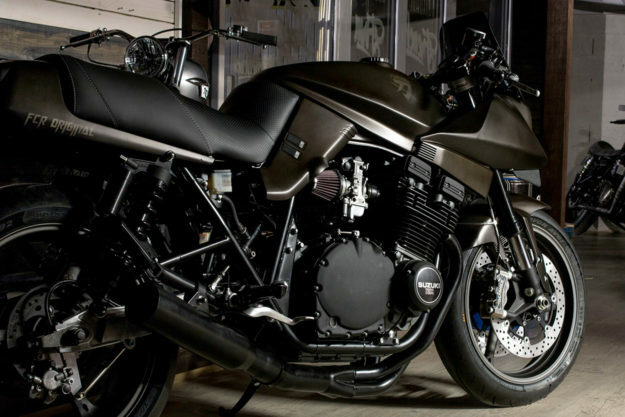 Interest in large Japanese street bikes was waning: the CBs, KZs and GSs had started to lose their allure. 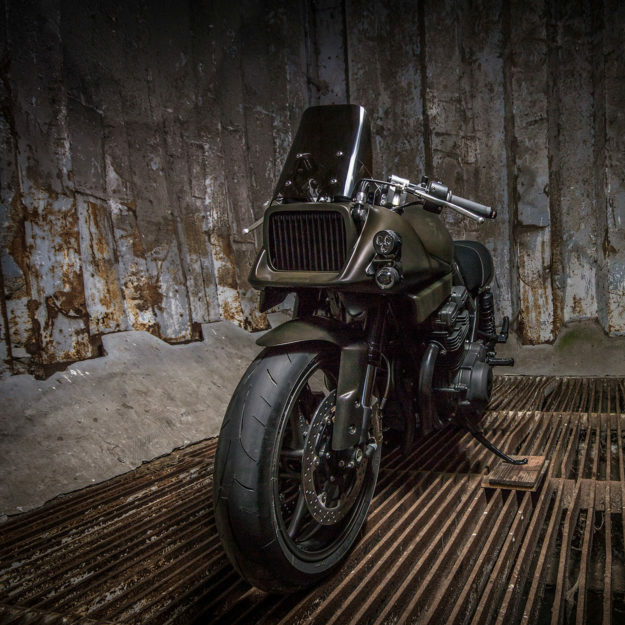 Japan’s most conservative motorcycle maker instructed its German marketing boss to put a call in to Hans Muth, BMW’s former chief of styling, and his Target Design consultancy. 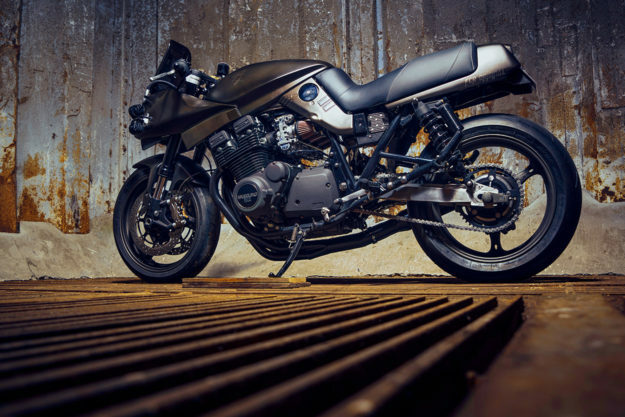 The Katana was result, hitting American streets in 1982 and finally giving motojournalists something interesting to write about. 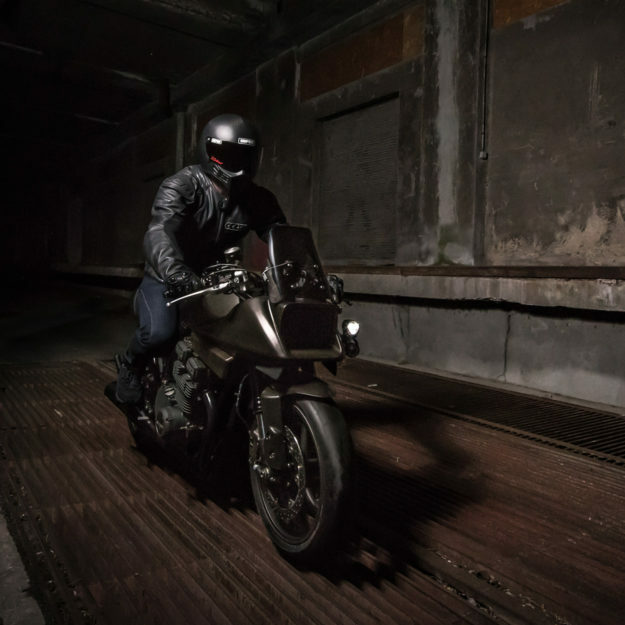 Bike builders Sébastien Guillemot and Mathieu Ménard are giving us something interesting to write about too: This hot-rodded Katana is the latest release from their workshop FCR Original, based in northern France. We love the way ‘Furiosa’ retains the sharp-edged aggression of the original Target design, but adds a whole raft of tasteful upgrades—a true resto-mod. The action starts with the transverse four-cylinder engine, which has been boosted out to 1166 cubic centimeters and now breathes through Mikuni RS flat side carbs. There’s a Dyna 2000 ignition and Dyna coils to keep the spark strong, plus a high-flow oil pump to stop the motor overheating. FCR have also fitted an EBC SRC Race/Sport clutch kit with Kevlar lined plates to handle the extra power. The suspension is heavily reworked too. The Katana’s original telescopics look rather spindly to modern eyes, and have fallen behind in performance—so FCR have replaced them with Showa ‘Big Piston’ forks. The back end is tightened up too, with new Gazi shocks. If the wheels look familiar, that’s because they’ve been lifted from a GSX-R750, (along with the compact front fender). They’re shod with Avon 3D Ultra Xtreme track day tires. No Firestones here. The brakes are a mish mash, with components from Nissin and Beringer—although they’ll be a big step up from the originals. Just check the size of the front disc. 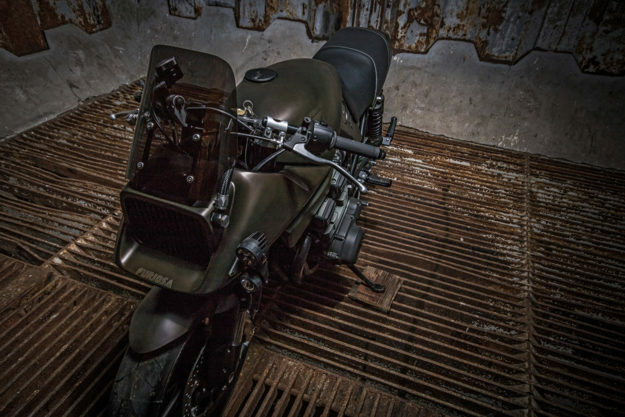 There are subtle mods to the tail section and rear subframe, but the seat is completely new and looks spectacularly plush by modern custom standards. The rider is also treated to LSL clip-ons and Daytona instruments, with Motogadget supplying the discreet bar-end turn signals. FCR have wisely left the bodywork mostly intact: After all, the rakish angles and creases are the defining points of the mighty Katana. There’s new paint though, in a most luxurious dark bronze color, and there’s new black paint on the engine as well. It’s stealthy in the best possible way. 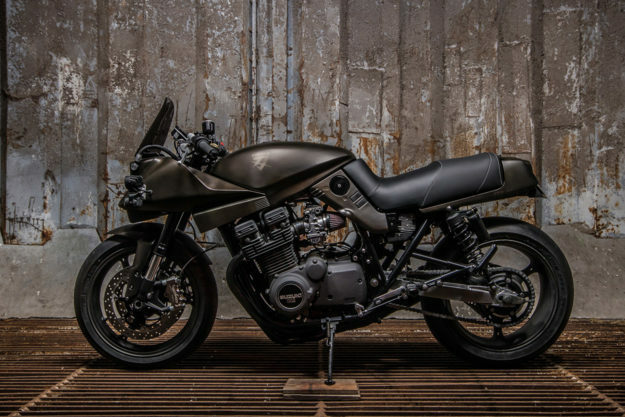 FCR’s last bike was an elegant Bonneville with a nickel-plated vintage vibe, so the Katana is a major departure for Sébastien and Mathieu. But if this is what the future holds, we’re all for it. Who else is in?